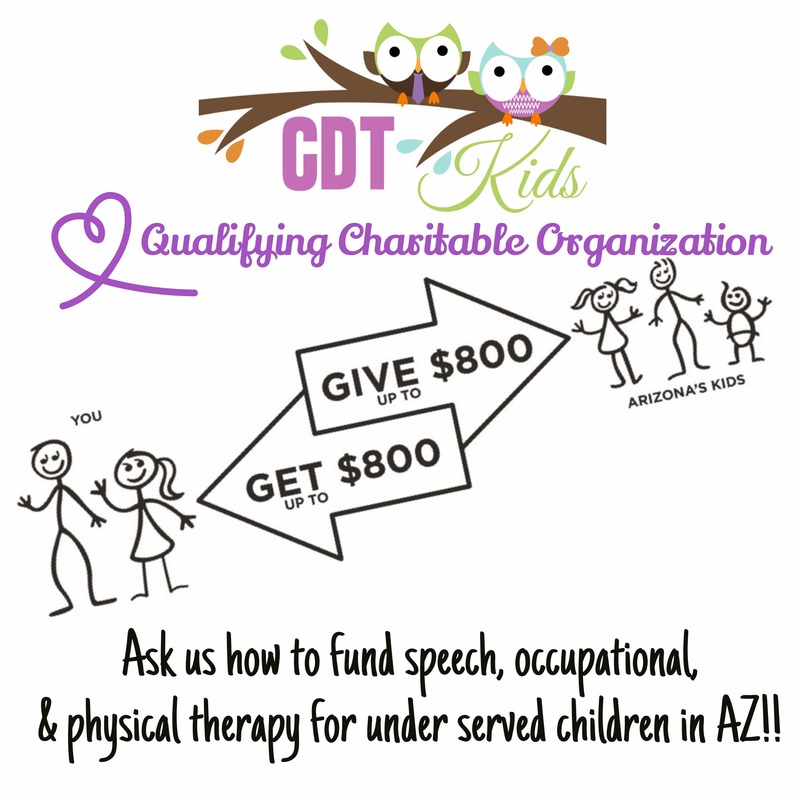 CDT Kids is a Qualifying Charitable Organization (QCO) for the AZ Tax Credit. You can take a tax credit against your tax liability for making a financial contribution to CDT Kids. This is in addition to any Arizona public and/or private school tax credits that you may already be claiming. Up to $800 per couple or $400 as an individual. Credit eligible contributions made on or before April 15th, may be applied to either the current or the preceding taxable year and are considered to have been made on the last day of that taxable year. Thank you for helping inspire greater giving - we can't wait to use your donation to fund speech, occupational, or physical therapy for a child in need! Arizona provides tax credits for individuals who make contributions to charitable organizations "Qualifying Charitable Organizations (QCO)". Individuals making cash donations to charities may claim these tax credits on their Arizona Personal Income Tax returns. Effective in 2016, credit eligible contributions made on or before the 15th day of the fourth month following the close of the taxable year may be applied to either the current or the preceding taxable year and are considered to have been made on the last day of that taxable year. Any charitable contribution that is included in itemized deductions on your federal return must be removed from your Arizona itemized deductions if the contributions were claimed as an Arizona credit. Donations made to organizations not listed on the department’s published website are typically allowable as deductions. You cannot claim both a deduction and a credit for the same charitable contribution on your Arizona return. Must be exempt from federal income taxation under Section 501(c) (3) of the Internal Revenue Code or a designated community action agency that receives community services block grant program monies pursuant to 42 United States Code Section 9901. Must spend at least 50% of its budget on services to Arizona residents who receive Temporary Assistance for Needy Families benefits, to Arizona resident low-income households or to chronically ill or physically disabled children who are residents of Arizona. NOTE TO DONOR: Many charities indicate on their websites if they are qualified for this credit. Annual reports are often available online as well so that you can see how the organization spends its money. If a charity’s website does not provide this information, you can call and ask for copy of its certification letter from the ADOR.